This time the adventure begins at your doorstep. Just a few things packed up on two bikes and off they went. Read down below more about an inspirational journey on wheels. Thank you, Johan and Olivia, for sharing your travel diary with us. This story begins in Berlin, on a great Wednesday, the weather is “ice cream melting in your hands warm” and the streets are buzzing with life. This is my first morning ever in Berlin and what a cool and diverse place with its flourishing cultural scene and a way of life that’s both fast-paced and relaxed. I’m here meeting up with my super cool, badass bike friend Olivia who is fortunate to call Berlin her home. Let’s see what Berlin has to offer! Wrangelstraße 18, is where we meet up with Stefan and his friends at the 8bar showroom. If you, like us, are into bikes then this is definitely a place to visit when you’re in the neighbourhood aka Berlin. 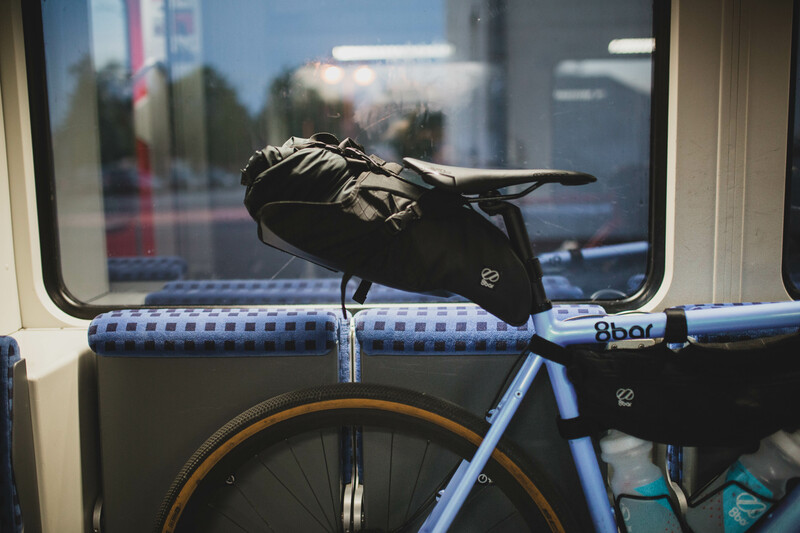 8bar is a local Berlin brand that has made a name in the international cycling scene with their fixed gear team, but also lately within the road-racer and adventure cycle segment and this is why we are here today! 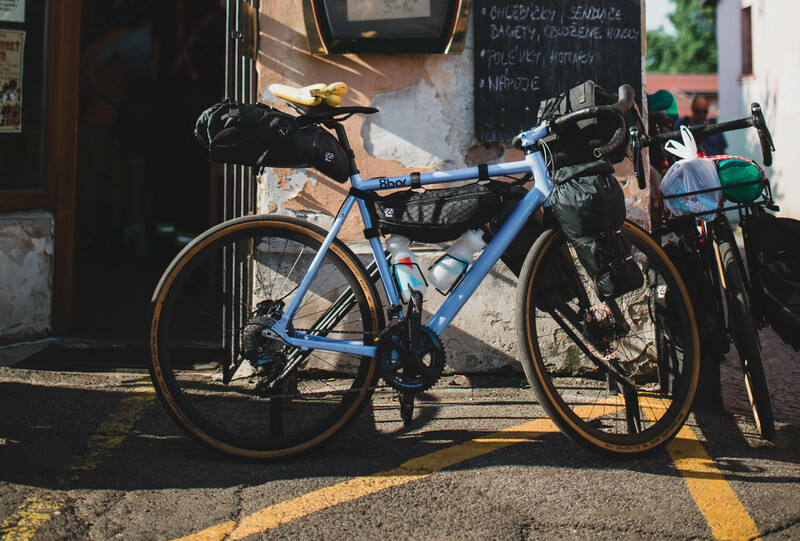 We meet with our companions for the next week, the 8bar MITTE, an adventure bike sporting a striking design, with its deep and capturing blue and red color and “swiss army knife” / “germen efficient” features. 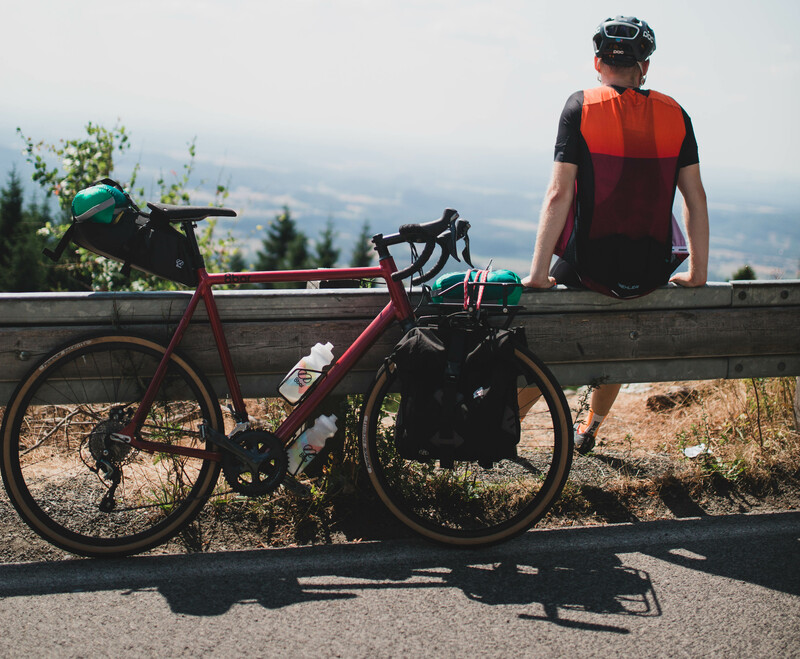 The MITTE is one of a kind in that you with a swap of the fork and adjustment of the slider dropouts, can revamp its head, seat angles and bottom bracket drop to essentially transform it from a road bike into an all-road adventure machine. Just like bumblebee shifting into a Camaro. The retro “whitewall” balloon tires really are the icing on the cake, giving flashbacks to classic cars, retro racing and turning heads everywhere you roll. Setting out we didn’t know exactly where to go, but one thing was at least crystal clear: We wanted hills, preferably mountains! 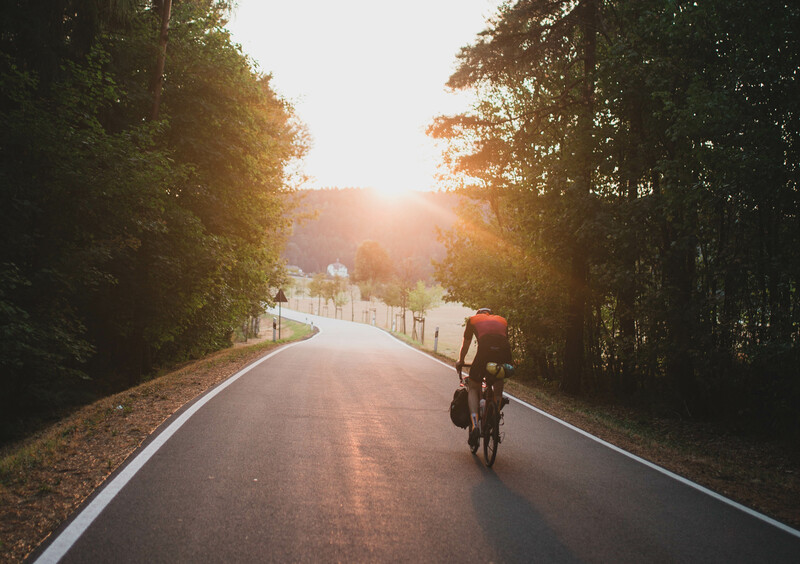 After some research we found out that there are some epic cycling in East Germany and Czech Republic. 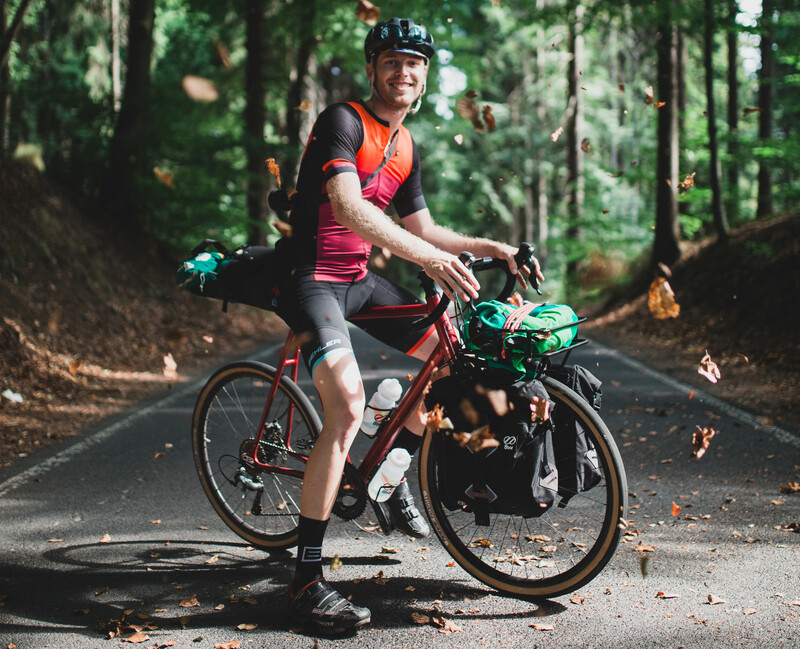 The route would take us through the two national parks, The Saxon Switzerland National Park, amazing mountains, endless views and literally breath-taking hills & the Bohemian Switzerland National Park – the Czech equivalent with deep forests, clear waters, swivelling hills and mountains. We managed to squeeze in a day of gravel, crossing a river and hiking through an enchanted forest, well at least this was what an enchanted forest would have looked like in our minds. 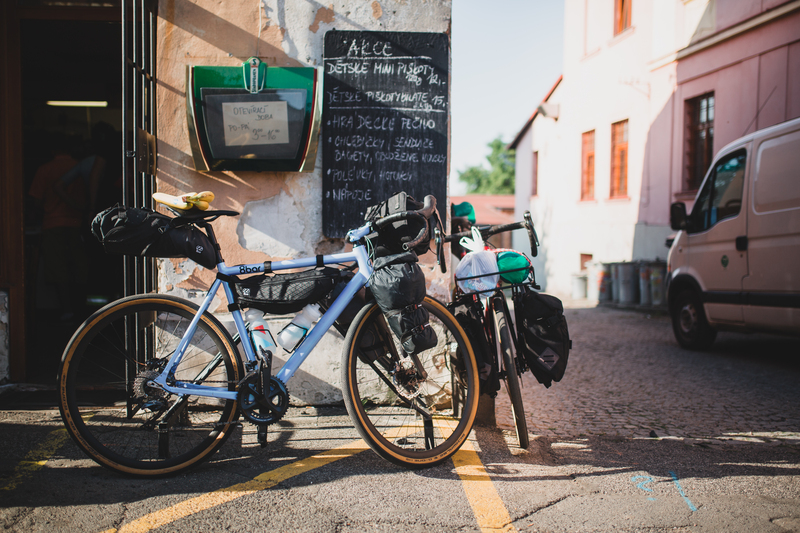 This was a five-day bike-packing trip, but looking back at it now, it feels more like a two weeks adventure – Crocodile Dundee style! We started of in the German town Pirna, already late because of train failures, something like burning brakes, but hey! We made it! The first evening was the best so far! We did 50km on smooth roads and found ourselves climbing up classic serpentine hills, putting a big smile on our faces and some well deserved burn in our legs. We finally found a perfect spot for our hammock and fell asleep after about one hour of scaring each other with ghost stories and the boogieman. We summit the mountain Ještěd, 1 012 m, with a massive pointy “sputnik” looking cone building at the very top. The next day was as amazing as the first. This was the day we entered Czech Republic, for the first time. 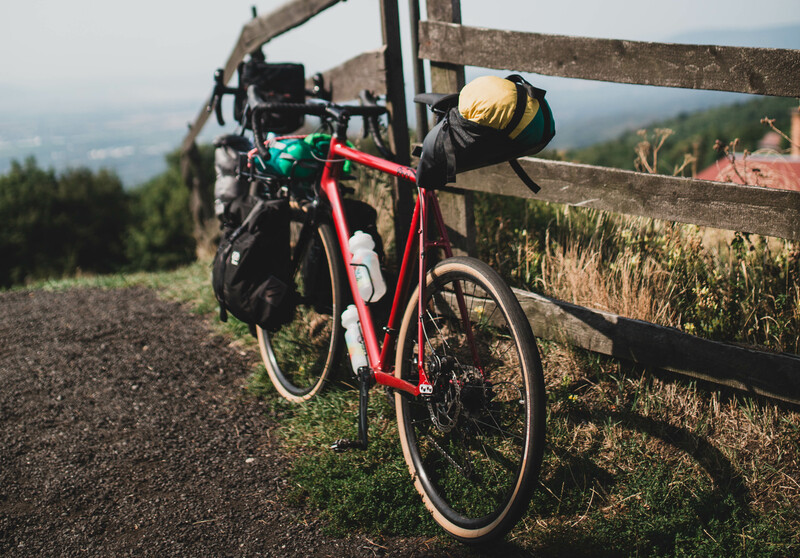 The bikes showed us another side when they killed it on the backroads and gravel paths, making it an absolute pleasure to ride! Right when we started to believe that this was too good to be true, and that we would find unicorns around the next corner, we found ourselves facing what we later called “the AC/DC hill”. It felt like we had time to listen through a full “best of” record suffering our way to the top! But the view was all the reward we ever dreamed of when we finally made it to the top accompanied by the sound of “Back in Black”. The day ended on a high note when we stumbled upon a local pizza place, cash only and where we had to walk through the bar and the kitchen to get to the seating area. Good food and great people, but they must never have seen someone looking as fast as we did in our colorful cycle gear from our friends at Biehler. Snug as a glove and perfect fit; the coolest and latest in cycle fashion, but they still seemed pretty surprised about our tight lycra – NASA looking outfits. With AC/DC still ringing in our heads we got started the next morning. Low on caffeine we set out hunting for a breakfast oasis in the rough Czech landscape. We found sanctuary in the shades of a monastery, eating fake peanut butter and refilling with instant coffee and carbs. We hit the road full of energy, fun and peanut butter and started our climb up the first mountain of the day. The Czech roads were amazing as well, and the small rural communities that we passed were pittoresque, neat and tidy with nice yards and traditional buildings. It was all looking like an uphill postcard. We summit the mountain Ještěd, 1 012 m, with a massive pointy “sputnik” looking cone building at the very top. Enjoying the views and refilling with schnitzel at the “sputnik cone restaurant” with the rest of the tourist crowds. 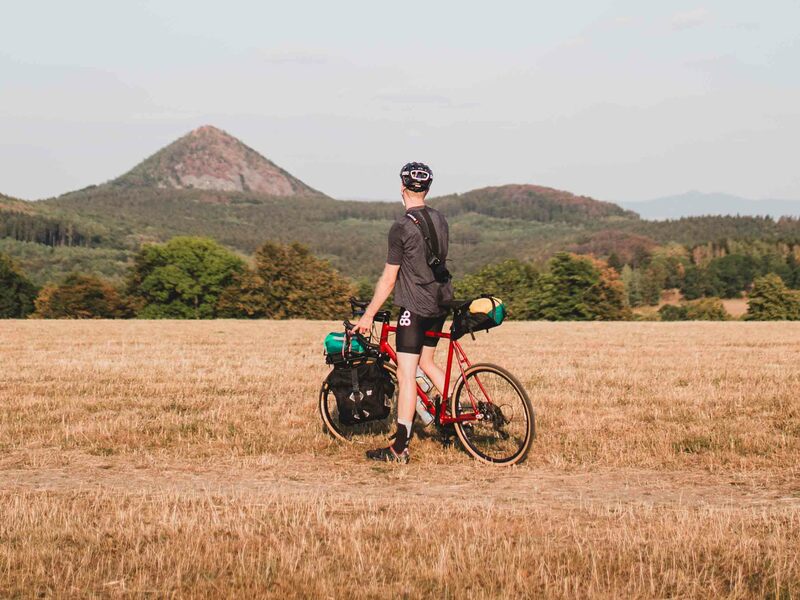 At some point, going up a small eternal gravel road at a 12% incline in the middle of the Czech wildwoods you start to ask yourself why, WHY you choose to spend your vacation like this and not on a beach in the shades of a palm tree reading a book. But the answer is surprisingly easy. I’ve never felt more alive then right here and now and these two wheels infused with my will to explore is all I need when it really comes down to it. This is everything an urban weekend warrior ever could ask for, a road to nowhere, sore legs from climbing and not a worry in the world. 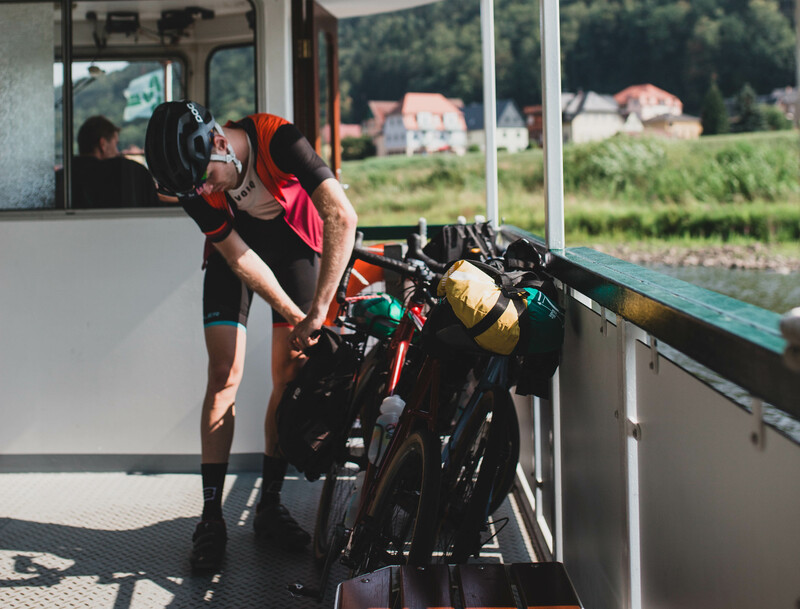 We crossed the border back to Germany later that day after numerous hours of fantastic cycling, but getting there really mustered the Bear Grylls in both of us. It was late afternoon when we turned left up a long climbing driveway, away from the small main road and the small village Dolni Sedlo. The single lane road turned into two tracks on the ground, merged into one track and then diminished into some kind of hiking trail. We followed our Wahoo with declining confidence further and further into the forest and the more and more dense vegetation. As the light was falling and our water supply ran low we really started to question our decision to leave the road. 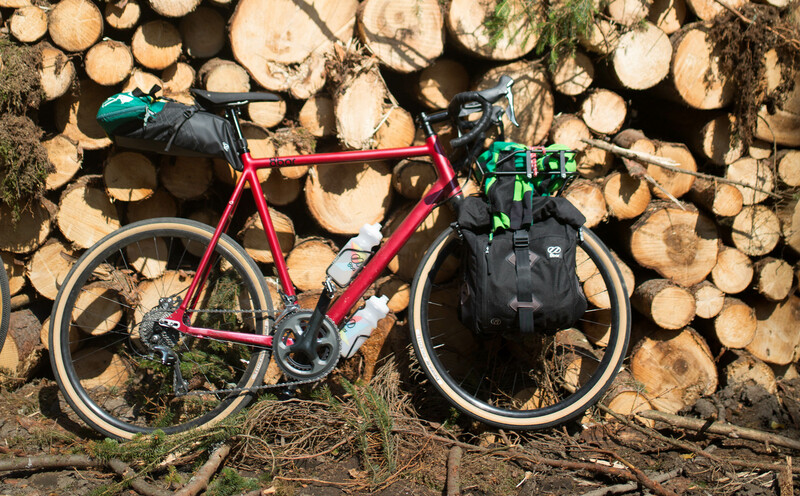 But pushing our bikes up an extra steep section through mud and thick pine trees reviled a gravel path, like an oasis in the desert emerging in front of weary travellers. 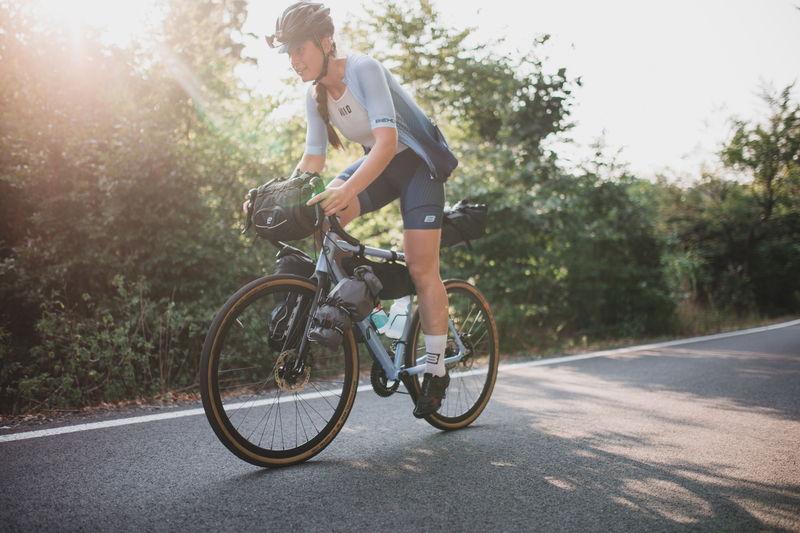 The evening offered and interesting perspective on bikepacking as we decided to stay the night at a hotel as the weather forecast for that night was warning with rain and we hadn’t brought a rain tarp for the hammock. We stayed at the charming local Parkhotel Zur Alten Rodelbahn, in Kurort Oybin, Germany. This was an amazing experience in itself not just because of the warm shower and the soft bed but because of what a great welcome and outstanding service we got here. The food was amazing, “can we have another plate of the same, please” kind of amazing, and it felt like visiting your grandparents, loving, caring and absolutely perfect hosts for the evening. Waking up to a hotel breakfast and freshly brewed coffee was a very pleasant experience and nice start of the day. 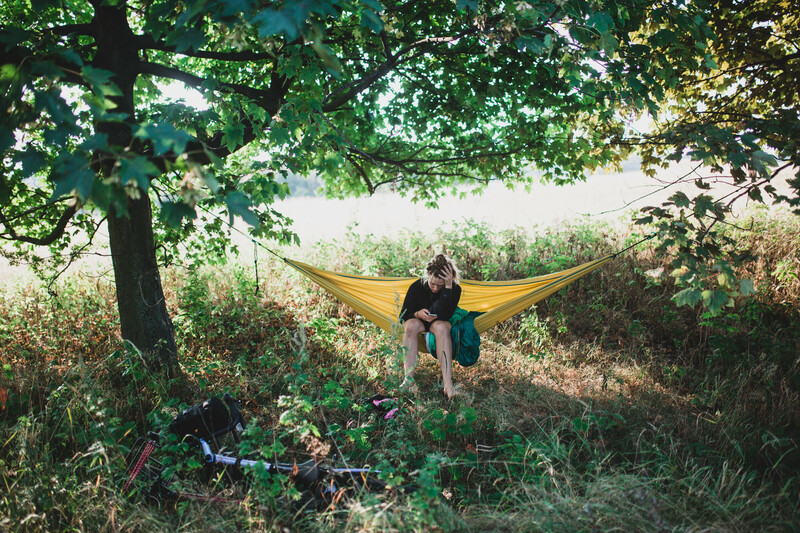 Bikepacking with minimal packing and a bit bigger budget has its perks: hotel, breaky, warm showers and soft beds, but we were already missing the familiar rocking of the hammock and sticky feeling of a day’s hard work. We left Kurort Oybin and kept climbing along our route. I realised I was slowly falling in love with my burgundy red shimmering bike, hankering our way up hill after hill, conquering mile after mile with ease and delivering smiles and a happy behind no matter what terrain. This adventure machine was coming out on top no matter what challenges we seemed to throw at them, up, down, slow, fast, smooth or rocky. 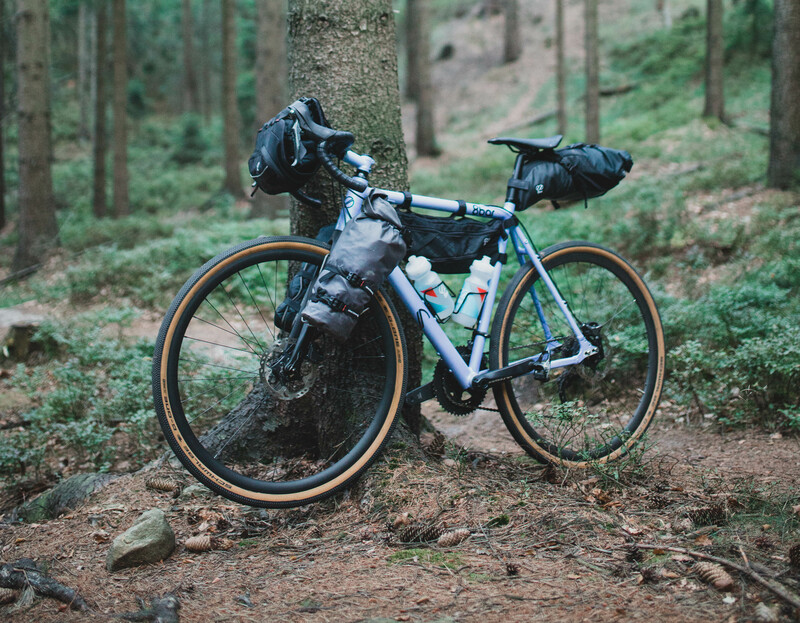 Bikepacking is an absolutely brilliant way of traveling and if you haven’t experienced it already go pack your bike-bags right now and get going! If you do know what I’m talking about, then you’re probably already packing your bags anyways! The travel experience from a saddle is an all you can eat buffet of impressions, views, smells, sounds, tastes, meetings and interactions. It is such a genuine way of getting closer to the people around you and the landscape that you travel. Experiencing culture and getting to know yourself. 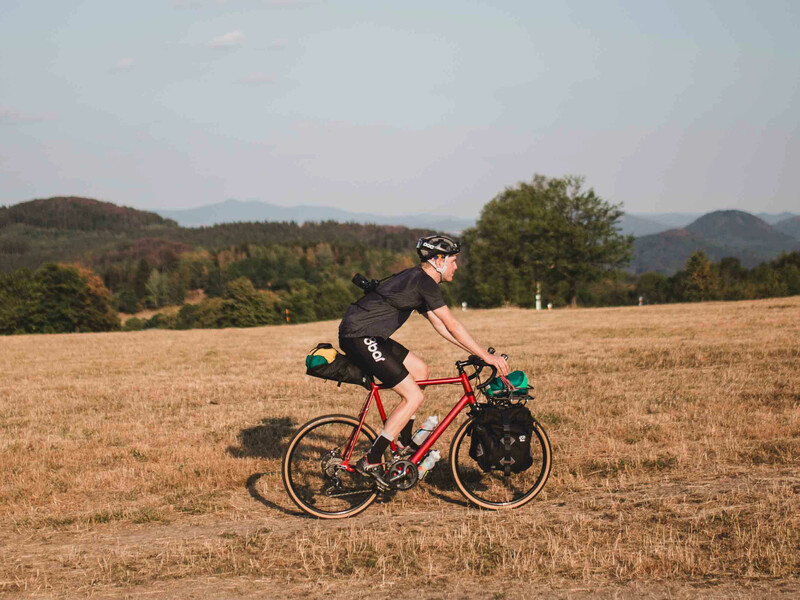 This was the short version of our brief but intense bikepack on the 8bar Mitte through the Czech countryside and mountains. For a more detailed narrative let us know and we can hook you up with this amazing route and some great connections and tips along the way! Until the next time we meet! Keep it cool kids! Yo!